Is Gareth Bale under threat from Vinicius Junior at Real Madrid? Four games. Four wins. 15 goals scored. Two conceded. That was enough for the Real Madrid hierarchy to decide that Santiago Solari was the right man to replace Julen Lopetegui, extending a caretaker arrangement into a permanent deal for the former reserve team manager until 2021. Whether he lasts that long remains to be seen, but Solari, a former Real player who has been working with the youth sides since 2013, has already made an impact as head coach. Summer signing Alvaro Odriozola has started every game under Solari and, after a slow start to life at the club, looks to be getting into form. Left-back Sergio Reguilon has come up from the reserve side and, like Odriozola, has started the last four matches. Another youth product, Javi Sanchez, has been on the bench. But perhaps the most significant move made by Solari has been the introduction of Vinicius Junior to the squad. Signed by Real Madrid last year for a reported fee of 46 million euros, Vinicius joined from Flamengo this summer as an 18-year-old. There was initially speculation that he might leave on loan to gain experience, but he stuck around, training with the first team and playing with the reserve side, Real Madrid Castilla, managed by Solari. 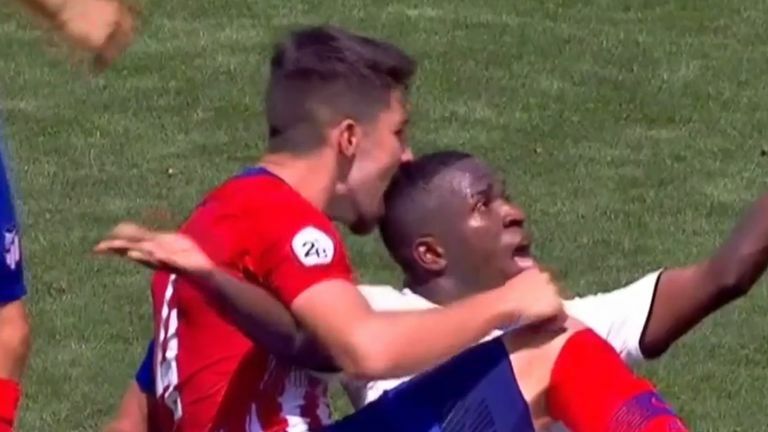 Vinicius scored four goals in five matches with Castilla, including two in the derby against Atletico Madrid - when he also had his head bitten by an opponent - and a stunning top-corner free-kick against Celta Vigo. However, he only played a handful of minutes under Lopetegui, who had batted away questions about when, and if, he would involve the youngster on a more regular basis. There were even reports that Lopetegui's handling of Vinicius played a role in his dismissal. If that was the case, it would partly explain why Vinicius has been involved more under Solari. He was handed his first start in the Copa del Rey against third-tier side Melila and provided two assists in a 4-0 win. "This is my style," he told Fox Sports after the game. "Take on my man and be effective and direct, while always looking for the goal." The display did not earn Vinicius a start in Real's next match, but he made an impact from the bench. With the score locked at 0-0 against Valladolid with 15 minutes left to play, Vinicius was introduced in place of Marco Asensio. Gareth Bale had gone off a few minutes earlier, having been whistled by home fans. Spanish newspaper AS would later say that Bale was "in his own world" while Marca said "the Brazilian [Vinicius] is joy, youth and speed and has a desire to take over the world, while Bale, on the other hand, represents a grey sadness that Real Madrid had until Vinicius' arrival in the second half." Vinicius broke the deadlock against Valladolid in the 81st minute, cutting in from the left and hitting a shot which deflected heavily off a defender and rebounded into the net for an own goal. He came off the bench in the 62nd minute of Real's next game - a 5-0 win at Viktoria Plzen in the Champions League - but didn't feature against Celta Vigo last time out. Former Brazil and Barcelona forward Rivaldo has said that he thinks Vinicius should have been "playing regularly from the beginning of the season". The Madrid press also appear to be keen to see more of Vinicius - and less of Bale. "Vinicius puts Bale in trouble," read the front page of AS recently. AS and Marca have ran polls where fans have voted for Vinicius to start ahead of Bale while an opinion column in Marca said that Bale has been "dispensable for some time". "The problem with Bale isn't just physical," wrote Carlos Carpio in early November. "It's about mood, mentality and leadership…he is unfocused, indifferent, disengaged, hardly participating." Even on international duty Bale has not been able to escape criticism. After Wales' friendly defeat to Albania this week, AS posted a clip of Bale defending in the right-back position and allowing a pass to get past him. There's nothing remarkable about Bale's actions - he stands, doesn't get beaten by the player, and then can't get the ball as it goes past him - but AS say this is "Bale being Bale more than ever" and "many Welsh fans have shown their displeasure with their top star after this lack of urgency". Bale's battle for popularity in Madrid has not been helped by his injury issues - of which there have been plenty - and also his lack of goals this season; his recent strike against Viktoria Plzen ended a 532-minute drought. He has become a target for frustrated fans and those around the club looking to apportion blame. Yet Solari does not seem to be swayed by the noise from the press or the fans, who have whistled and jeered Bale this season. Bale has started the last three matches under Solari, only missing the Copa del Rey game, and the Real Madrid boss has called him a "fantastic player" with "enormous qualities". Solari has also played down the hype around Vinicius. "Footballers cannot fight against what goes on around them," he said. "The media, the fans, they are excited about Vinicius and that is fantastic, but his virtues are as evident as his weaknesses and his age. He has had almost no time to mature." In fact, rather than Bale, it is Isco who has been most impacted by the change in the dugout. A regular starter under Lopetegui, Isco has only played 51 minutes in Solari's four matches. He has recently returned from injury and team-mate Dani Ceballos said last week that Solari thought he was a "bit out of shape". Amid a difficult start to the season, and with Cristiano Ronaldo no longer around, it is not surprising that those outside the team are lobbying to see more of Vinicius, who AS columnist Alfredo Relano has described as "an intelligent, anarchic, rebellious player, who was being missed even before we got to see him in the attack". But what does his presence actually mean for Bale? Solari has pointed out that he wants more consistency from Bale - "we want to enjoy him, in every game" - while also saying there are "no automatic starters here, never". That could be seen as a warning to several players after a below-par start to the season, but also a way of Solari challenging his stars. Despite his price tag, Zinedine Zidane was quick to drop Bale last season if he felt he was not performing at a high level, and Solari still has options if he did decide to make a change, even without Ronaldo. That should act as motivation for Bale, who was expected to step up in the absence of Ronaldo but is yet to grasp the opportunity. Instead he again finds himself competing for a place with a rival, one that is younger and has the backing of the fans, and maybe the head coach.